Linger is a spellbinding love story that explores both sides of love—the light and the dark, the warm and the cold—in a way you will never forget. 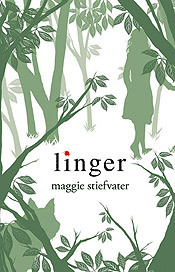 In Maggie Stiefvater’s Shiver, Grace and Sam found each other. Now, in Linger, they must fight to be together. For Grace, this means defying her parents and keeping a very dangerous secret about her own well-being. For Sam, this means grappling with his werewolf past . . . and figuring out a way to survive into the future. Add into the mix a new wolf named Cole, whose own past has the potential to destroy the whole pack. And Isabel, who already lost her brother to the wolves . . . and is nonetheless drawn to Cole. Now can’t wait for the third and finalbook: Maggie reads a teaser from FOREVER!